Note: There is no English translation for the following text. Posted in Isla Margarita Seminar, Meetings & Events, Other Events on July 9, 2015 . 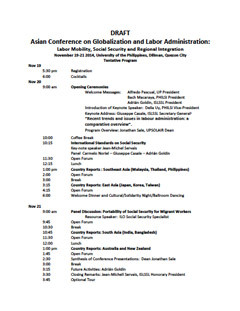 Posted in Meetings & Events, Other Events on August 11, 2014 . Posted in Isla Margarita Seminar, Other Events, Young Legal Scholars Section on June 3, 2014 . 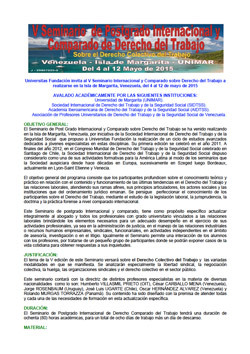 You can find the final agenda of the Seminar of Isla Margarita in the Spanish version. 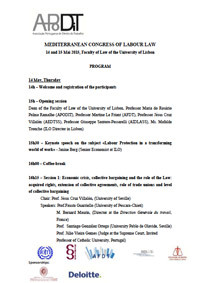 The Postgraduate Seminar on International and Comparative Labour Law of Isla Margarita has been on-going since 2011 under the organization of the Fundación Universitas and under the auspices of the Venezuelan chapter of the ISLSSL, which has awarded scholarships with a view to promoting the participation of young lawyers. From the forthcoming edition, and as announced during the last meetings of our Executive Committee and the General Assembly (Santiago, Chile), we would like to deepen our relationship with the aforementioned seminar. This renewed relationship will be based on the creation of an International Advisory Committee, composed of representatives designated by each of the Latin American national associations of our society. Its role will be to act as a consultative body at the time of organising each seminar and when deciding on the granting of ISLSSL fellowships. As far as the design of each seminar is concerned, the organizers should consult the Committee before the elaboration of the program – topics, speakers, activities, etc. – or to submit the draft programme to the Committee, for evaluation and suggestions as well as the request for fellowships. Having agreed on this occasion to assign fellowships of U.S. $1,000 each, we will proceed to the establishment of a fellowships subcommittee with a maximum of five persons to be selected from Committee members (as far as possible) and among those national societies which have not submitted candidates for fellowships, with a view to ensuring maximum transparency and integrity for the selection of candidates. The submission of applications for scholarships should be carried out by the respective national association, accompanied by a curriculum vitae of the applicant and certifying compliance with the ISLSSL rules for the granting of fellowships. Posted in Isla Margarita Seminar, Meetings & Events, Other Events on March 10, 2013 .